The Forget Me Not Family Society has been involved in many advocacy and education events during the past year. Our FMNFS mandate (see details on page 2 of our Adoption Circles Newsletter) specifies that a major purpose of our society is to raise awareness and to educate people about adoption and reunion issues. In response to this purpose we are delighted to share with you about a major event which occurred recently. A brief history will help to set the stage for this presentation. In February 2012 while preparing for our Winter 2012 issues of our AC (theme – Education) I emailed the Social Worker programs in more than 20 universities in Canada (e.g. UBC, SFU, universities in Kamloops, Ontario and Alberta) in the U.S. (e.g. Harvard, Yale, Johns Hopkins) and Australia to inquire if they offer any programs or course work in the effects of adoption loss, trauma, grief, search and reunion, or are they considering offering such courses in the near future. Eleven universities responded with a ‘No’. The remaining universities did not respond. The response was disheartening but not surprising. However not being one to take a ‘NO’ sitting down, I pursued a somewhat interesting response from one professor at the University of British Columbia. A series of conversations followed with Dr. Edward Kruk, Associate Professor in the School of Social Work at U.B.C. 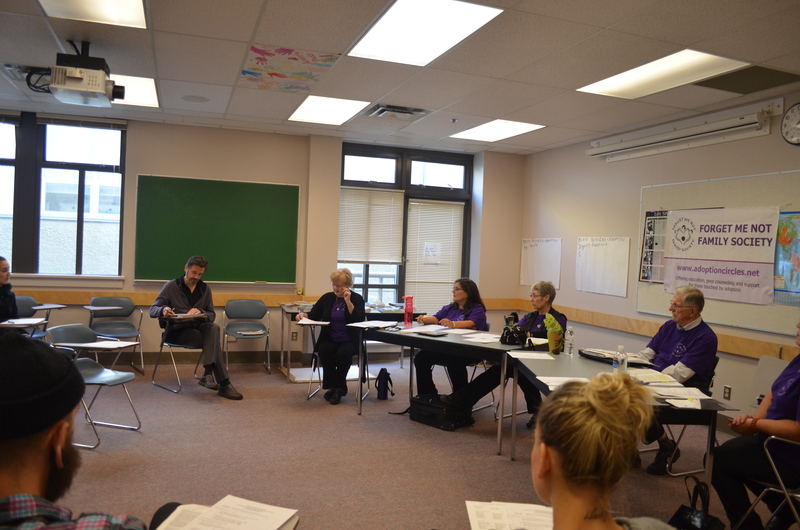 The FMNFS was interested in how to create a working relationship with students in the graduate program for the purpose of involving graduate students in helping us with the review and possibly the presentation of our 6 week community education course. At that time Dr. Kruk informed us that while there were no courses being offered at U.B.C which addressed post adoption and reunion issues, he was hopeful that such a course could be developed in the near future. Early this year we received an invitation from Dr. Kruk inviting us to make a three hour presentation to his students this fall, as part of a new course he was in the process of developing. Recognizing the magnitude of this opportunity, (to our knowledge the first ever presentation in a North American university) we were delighted to accept this invitation. Thus began a 6 month intensive preparation for what this presentation might look like, goals, process, content and who would be involved on the presentation team. Evaluation: The session evaluation was a two part process. Prior to, and at the conclusion of the presentation students were asked to individually reflect on, and write down their knowledge and understanding of six issues or aspects of adoption. A summary of student reflections and responses before and after the presentation is included following this article. Overall rating of the presentation from students and from Dr. Kruk ranged from positive/useful (5 responses) to very positive/very useful (11 responses). Impressions: Students appeared to be very engaged in our presentation. Many were clearly stunned by facts and issues discussed as was evident by their ‘deer in the headlights’ reactions to many facts shared and issues discussed. There is a distinct difference in both the quantity and quality of student responses following the presentation when compared to responses noted prior to the presentation. Post-presentation responses reflect a much deeper understanding and appreciation of the complexities of issues surrounding adoption and reunion. Verbal feedback to our team members during the break and following the session revealed further responses and expressions of surprise, shock and gratitude which were not included on the evaluation form. Dr. Kruk thanked us several times for what he described as our “outstanding presentation” and that he was “very impressed with our team work.” He added that our presentation was very different from what he had expected: it was much more intense. He invited us to address his students graduate next year, an invitation we enthusiastically accepted. · Understanding trauma associated with adoption for all 3 in the triad. · Adoptee- perfect or acting out! · Fear of child being taken back. · A widely diverse population, some supporting and some opposing open adoption. · Are recognizing the importance and benefits of open adoption. Adopted child stuck in the middle. Focus on mothers but not on fathers? When mothers willingly give up children for adoption does all this stigma still exit? How do you know when adoption is appropriate for a family situation? What is the role of the adoptive parents in the reunion process? Do women today actually have a choice about giving up their babies for adoption? How to define their relationship after meeting /reunion? Competing rights of triad members?